Early detection of eye diseases is crucial for your long term eye health. 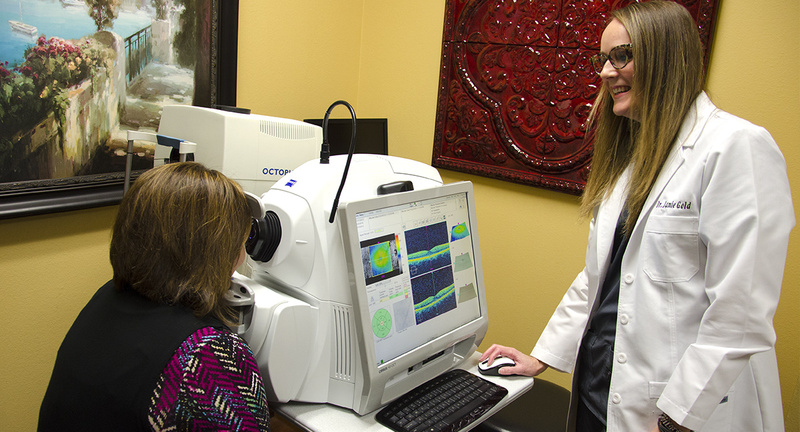 Today’s Therapeutic Optometrists do much more than prescribe glasses and contact lenses – they also diagnose, treat, and manage both ocular and neuro-ophthalmic disease. Therapeutic Optometrists are the primary care physicians for the eye and are often the first to diagnose pathology in the eye or in related structures (such as the brain). Therefore, it is important to receive yearly eye examinations so that problems can be detected early. Commonly referred to as 'eyelash dandruff', blepharitis generally causes itching, redness, and a foreign body sensation of the eyelid margin. Blepharitis can sometimes occur alongisde other skin conditions or allergies. GPC is characterized by large nodules, or bumps, on the underside of the upper eyelid. These nodules are usually an inflammatory response to contact lens wear. They can produce symptoms of itching, burning, foreign body sensation, and contact lens discomfort. "Red eyes" (or 'pink eye') may be the result of any of the following conditions: bacterial infection, viral infection, fungal infection, allergies, or inflammatory conditions. Most of these conditions will look the same and may cause symptoms of burning, itching, blurred vision, redness, tearing, mattering, or colored discharge. Pterygium and pinguecula are both excess growths of conjunctival tissue (the clear membrane that covers the white part of the eye). A pinguecula is excess growth that is limited to the white part of the eye and a pterygium is that growth which extends over the cornea itself. Corneal ulcers are caused by infections (either bacterial, viral, or fungal) that invade the corneal epithelium (outer corneal layer) and cause an infection of the cornea itself. Eyes with a corneal ulcer are usually very red, painful, and photophobic (sensitive to light) with decreased vision and discharge. Keratoconus is an inherited degenerative disease that causes thinning of the central cornea. This thinning leads to severe corneal steepening and warpage. In later stages of keratoconus, the cornea assumes the shape of a cone (as indicated in the picture). Glaucoma is most likely inherited and causes a progressive atrophy of the optic nerve which results in permanent loss of peripheral vision. High eye pressure can also increase your risk of developing glaucoma. Dry eye syndrome is caused by a disturbance in the quality or quantity of the pre-corneal tear film. The symptoms of dry eye are a "gritty" or "sandy" feeling in the eye, redness, blurred vision (which will usually clear with blinking), and occasionally excess reflex tearing. The image shows spots on the cornea caused by loss of epithelial cells due to dryness. Ocular tumors come in many different shapes, sizes, and severities. They can be present on the eyelids, eyeball, or behind the eye in the orbit. Neovascularization is the scientific term for "new vessel growth. It is generally caused by improper contact lens wear and can lead to serious problems for an eye. Cataracts are opacities in the crystalline lens in the eye (behind the pupil) that can occur as a result of trauma, age, diabetes, medications, or congenital origin. Macular degeneration is a condition that causes scarring of part of the eye that is responsible for a person's center vision. It can be visually detrimental and must be treated appropriately. Diabetes can cause the blood vessels in the back of the eye to leak and cause problems with vision. Retinal detachments can occur when the retina itself is pulled away from the back of the eye. As the retina is pulled away from it's blood supply, it begins to die from lack of oxygen and nutrients. This can lead to permanent vision loss in a short amount of time. Episcleritis and scleritis are inflammatory conditions of the sclera (the white part of the eye). Patients with scleral disease will have severe redness to the sclera but may or may not exhibit other symptoms such as: eye pain, blurred vision, sensitivity to light, and tearing. Thyroid eye disease can cause double vision, loss of vision, redness, and irritation to the eye. The most common problem associated with thyroid eye disease is dry eye. Anterior uveitis (also known as iritis) is an inflammatory condition which involves structures on the inside of the eye. Patients with uveitis often have redness of the eye, tearing, sensitivity to light, and eye pain or dull ache around the eye. It is typically linked with systemic disease and will not resolve without treatment. Optic neuritis is defined as an acute inflammation of the optic nerve. It is most commonly associated with multiple sclerosis (MS). Patients with optic neuritis usually present with a sudden onset of blurred vision which gets worse over a period of approximately 10 days, stabilizes, and then improves. Other symptoms are decreased brightness sense in the affeted eye, loss of color vision in the affected eye, loss of visual field, and pain with eye movement. The optic nerve of the eye is a direct extension of the brain. It carries visual information to many parts of the brain for processing. Many times, strokes in the brain cause visual symptoms. These symptoms can include loss of central vision, loss of peripheral vision, double vision with the appearance of a 'lazy eye', pupil abnormalities and eyelid droop. Swelling of the optic nerve can be the result of many different pathologies that can lead to permanent loss of vision. There are many tumors and aneurysms of the brain that can lead to ocular symptoms. Because the visual system is attached to so many different areas of the brain, these tumors often involve ocular structures.